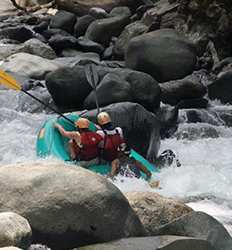 The Central Pacific Coast of Costa Rica is a place that begs to be explored and whitewater rafting is if not the very best, certainly one the most fun things to do in Costa Rica. Take a break from the surf, head south and traverse Costa Rica's wild side on one of our Jaco whitewater rafting tours. We offer two different river rafting tours in Jaco with different degrees of difficulty. For those who are trying whitewater rafting for the first time, we recommend the Class II and III rapids of the Savegre River Rafting tour. Are you really wanting to get your adrenaline pumping? For our more experienced rafters we offer the Class III and IV rapids of the Naranjo River rafting tour. Pick your favorite rafting excursion in Jaco and rest assured that our bilingual guides will keep your safety as their top priority so all you have to do is paddle out and have fun! Below we have compiled a list of whitewater rafting tours in Jaco available to you. Now let's take a break from Jaco Beach and go whitewater rafting in Costa Rica! Are you ready for extreme adventure and heart-pumping whitewater? Then our Naranjo River whitewater rafting tour is waiting for you! This discount white water rafting tour is customized for experienced rafters who are ready to take on intense Class III and IV rapids. Have you always wanted to try whitewater rafting but weren't sure you have what it takes? 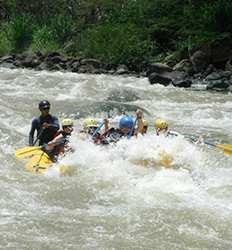 Then take advantage of this this amazing opportunity to go rafting the Savegre River on this thrilling introductory Class II & III whitewater rapids tour. Whitewater Rafting the Savegre River Class II & III deposit is $15.00 per person departing from Quepos & Manuel Antonio and $20.00 per person departing from: Jaco, Herradura, Esterillos or Los Sueños.